Astronauts Michael Good and Garrett Reisman carried out a successful six-hour 46-minute spacewalk Friday, completing the replacement of six space station solar array batteries, installing an ammonia coolant jumper and retrieving a robot arm grapple fixture. Four 375-pound batteries were installed during a spacewalk Wednesday and the final two were replaced today. The six old batteries that were removed from the truss are now secured on a cargo carrier for return to Earth aboard the shuttle Atlantis. The carrier pallet will be mounted back in the shuttle's cargo bay Saturday. Good and Garrett cleaned up the P6 worksite before moving on to their next task, retrieving a robot arm grapple fixture from Atlantis' cargo bay. 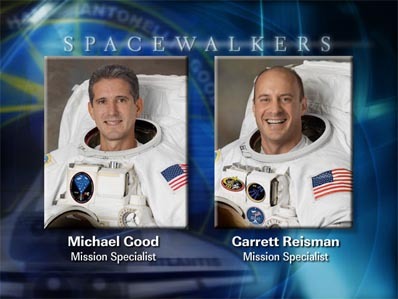 The spacewalkers also got around to a few final "get-ahead" tasks, adjusting an insulation blanket on a robot arm extension and restocking external tool boxes. They even found time for a bit of sightseeing before returning to the International Space Station's Quest airlock module, marveling at the view of the Kennedy Space Center and Cape Canaveral from 220 miles up. "Are we over, like, Bermuda or something?" Reisman asked. "Yep. The Bahamas," pilot Dominic Antonelli replied from Atlantis' flight deck. "You can see the Cape if you look back the other way," Antonelli said. "Runway 15/33 looks pretty clear," someone said. "You can see it?" Reisman asked. "Yeah. That's cool," Good replied. "I can see the SLF, I can see the two pads, I can see the skid strip." "And Houston, we've got the field in site," Antonelli joked. "Houston copies. We'd rather you not land just yet," astronaut Steve Swanson replied from mission control. The spacewalk began at 6:27 a.m. EDT and ended at 1:13 p.m., boosting the crew's total EVA time through three spacewalks to 21 hours and 20 minutes. Total space station EVA construction time through 146 spacewalks now stands at 914 hours and 53 minutes, or 38.1 days. "It was three great, fantastic EVAs," Swanson called at the end of the spacewalk. "We appreciate all your work."